The terms “grading up” and “breeding up” are often used synonymously and interchangeably in the livestock world, and this generally does not matter, although they do refer to somewhat different processes. The former is aimed at increasing the number of animals of a particular breed by a carefully controlled system of cross-breeding. It is resorted to where a breed has become so low in numbers that it is at risk of becoming extinct. 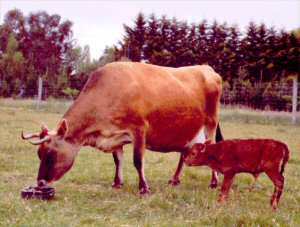 The cross-bred progeny produced during this process are known as ‘grade’ animals. Breeding up strictly refers to the system used to increase or fix a single desired feature of a breed, for example, colour or coat-type. It may involve cross-breeding or simply selected matings within a breed. Both processes involve the orderly manipulation of the genetic makeup of the animals that are the end result. The purebred Dexter bull was mated to these cows. Any resulting bull calves were discarded from the breeding programme, but the heifers were retained. These females were genetically 50% Dexter and 50% of the base breed; they were known as Grade One or G1 Dexters. These in turn were mated to a purebred Dexter bull and the heifer calves retained as Grade Two Dexters which were statistically 75% Dexter and 25% base breed. By repeating the above process two more times an animal was obtained which at Grade Four was almost 94% Dexter. At this level heifers could be admitted to the Herd Book as “purebreds”. Bulls, however had to be taken to Grade Five (nearly 97%) before being considered purebred. The scheme was so successful that by October 2005 there were more than 3000 Dexters registered in New Zealand, and from 30 June 2007 Grade One animals were no longer eligible for registration by the Society. It is important to note that this kind of grading up, which initially introduces a large quantity of genes from another breed, should be used only where numbers of a rare breed have fallen so low that the breed is seriously at risk of being lost. Other types of grading or breeding up do not involve an initial cross-breeding at such an extreme level. Two examples of such undertaken in New Zealand involved Galloway cattle and Alpacas. In the former, the rare White Galloway colouring was bred for by mating standard black Galloway cows to a purebred White Galloway bull and then using the mating system described above. In this case, however, white animals could be obtained by the second cross and these were immediately eligible for Herd Book registration. In the Alpaca world, a breeding up programme involved the rather rare long-coated Suri Alpaca. Numbers of this desirable strain were increased by crossing them with the more common Huacaya Alpacas. Because the long coat of the Suri is produced by a dominant gene, the resulting offspring were all long-coated (although 50% Huacaya genetically). From these animals, however, it was a relatively simple task by controlled breeding over several generations to produce animals which were almost 100% Suri. Besides increasing the number of Suri Alpacas, variations in colour could also be introduced. In all grading or breeding up programmes the secret of success is an initial understanding of the genetics involved together with a planned and controlled breeding programme. World wide, there has been some strong criticism of grading up programmes, mostly (though not entirely) because the increased population is obtained at the cost of loss of genetic purity. And it is interesting to note that many Dexter breeders in New Zealand proudly use the term “fullblood” to refer to animals that have no grading up in their ancestry – though this usage is frowned upon by the New Zealand Dexter Cattle Society.